‘Black holes’ are often the incentives that lure curious minds into the field of astrophysics and so was the case with me back in 2013, when I was an avid 9-year-old reader. 5 years later, here I am questioning the existence of ‘black holes’ itself. When I first came across the alternative theories to black holes, I considered them as preposterous claims by a bunch of iconoclasts. However, on further research, I learnt that nothing in the universe was defined; not even the very existence of what inspires countless amateur astronomers to pursue astronomy. Hence, let’s start this section of the blog (entitled as ‘black holes’) by first arguing against it and evaluating two of my most favorite theories. If there are no black holes, what is it that Matthew McConaughey dived into in the critically acclaimed film Interstellar? The first alternative we can come up with is fuzzball. Fuzzball is an idea proposed by the string theory that attempts to solve two problems related to black holes: the black hole information paradox and the problem of singularity at the center of the black hole. What is this black hole information paradox? Stephen Hawking’s theory on Hawking Radiation paved way for the conclusion that all information about the Universe going into the black hole was lost forever. On the other hand, quantum mechanics argues that you can determine the initial state of a system from its final state. Thus, in quantum theory, information is neither truly lost nor is it truly copied. Hawking’s theory showed that black holes will eventually evaporate along with the bunch of information it took in. This is a violation of quantum theory. 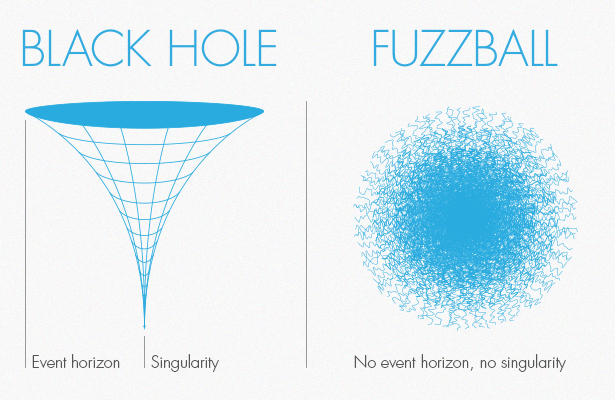 The other problem fuzzballs intend to solve is the problem of singularity at the heart of the black hole. Hence, black holes are re-imagined to have no event horizon and no singularity. Rather, the entire region within the event horizon is replaced by a ball of stings. String theory replaces point-like particles of the particle theory by one dimensional objects called strings. Hence fuzzball is indeed a ball of strings within what was envisioned as the event horizon. The fuzzball theory solves the black hole information paradox by agreeing with the law of reversibility (no matter how many times the direction of a beam of light is changed it will travel in the same direction) and the idea that the nature of all strings falling into the fuzzball is preserved as new strings that contribute to the fuzzball. Hence no information is lost. So, if you fell into a fuzzball, you would observe minimal change as your strings would just blend with other strings and form new strings that are larger and more complicated. The second alternative to black holes is Magnetospheric Eternally Shrinking Objects (MECO) proposed by an Indian scientist Abhas Mitre. MECO forms in the same way as a black hole with a large amount of matter collapsing inwards towards a single point. However, it does not form an event horizon. As it becomes denser and hotter, the Eddington Limit (this is when maximum luminosity is reached because there is a balance between the force of radiation acting outwards and the gravitational force acting inwards) would be reached. The collapse is asymptotic and will become slower and slower. The singularity will form in future at an infinite time. Hence MECO is collapsing forever. Hence during gravitational collapse of a massive star, MECO radiates its entire mass energy in an asymptotic manner and the process goes on forever. The radiation emitted would be trapped around the collapsing star because of its ever-increasing gravity. A stage would be reached when the outer pressure of trapped radiation will counter the inward pull of gravity arresting the collapse before a singularity could be formed. Whether what we observe in the sky is a black hole, MECO or fuzzball remains to be seen. Personally, I find the idea of MECO more compelling and interesting than a black hole or a fuzzball as the observations made around black holes seem to favor the prospect of MECO. To know more about the MECO, fuzzballs and black holes, look out for the next articles. So, keep reading!! And continue to speculate, innovate till you constipate. GRAVITATIONAL force/energy is proportional to (or BALANCED with/as) inertia/INERTIAL RESISTANCE, AS ELECTROMAGNETISM/ENERGY IS GRAVITY. This is proven by F=ma AND E=mc2. I firmly believe black holes do exist.At the death or your flesh body you inter into that black hole and inter into the 3rd dimension most of us call heaven. But that is for people who believe they do have a soul. Some do not believe that. Mecos are compelling….the supermassive black holes that are observed through their gravitational influence in near by Stars should be ridiculously massive,to begin with.Maybe protostars could get that ridiculously ( a purely scientific term) massive……. PreviousHow did the principle of equivalence get rid of the idea of absolute time?